One of the most highly favored golf invitations comes from off the bluffs near the sleepy town of Frankfort, Michigan. Nestled peacefully in the hills and valleys near Lake Michigan, I am not speaking of Arcadia Bluffs, certainly a noted course which merits national attention and the desire to play it. Instead, the journey heads a little farther north on M-22 to an obscure entrance you’ll probably bypass the first time. 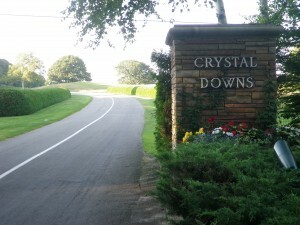 Find that entrance, keep driving higher and higher through residential trees and glimpses of sapphire waters, and you are well on your way to a place coming closest to the fabled Kingdom of which Michael Murphy writes: Crystal Downs Country Club. only sculpted. The design is as good today as it was 90 years ago, and the only question on the minds of members does not involve renovation, but instead whether or not to cut down a nagging tree guarding the right side of number 5; a tree which had the nerve to grow up SO big over the years, reminiscent of the game you play with children and grandchildren. 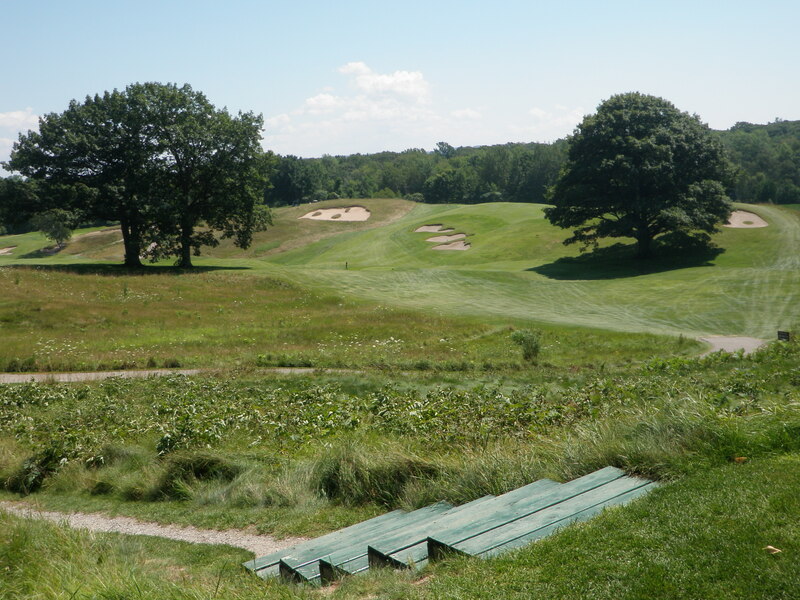 The storied 5th is a dogleg par-4 which can play longish and brutish or shortish depending upon whether or not you carry the steep hill the troubling tree guards. 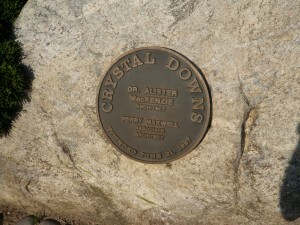 The tree was a mere sapling when Dr. MacKenzie dealt with it, and so it remained. Mackenzie's tree, now fully grown, creates a dilemma on the dogleg par-4 5th hole. 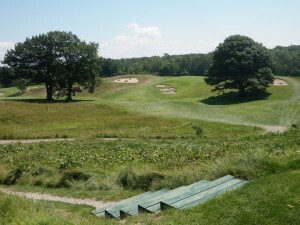 But that is what every hole at Crystal Downs is: a journey with options. You can play the course dozens of times and each round is a new adventure with weather and wind always a big IF. Long-time head golf professional Fred Muller, knowing full well his position as Keeper of the Gate is one of the best golf jobs in the world, can be seen almost daily in turtleneck and Dockers, even in the summer. In defense, the mornings can be cool despite 80-degree days and it is not often the day is still, with no breeze whatsoever floating in from the lake, about 200 yards away. 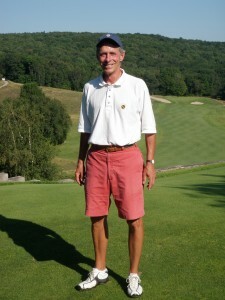 Although, the very warm and pleasant summer of 2010 was different: Fred sported some shorts and a Polo shirt when I joined him for an afternoon round in late July. But even an 80-degree day with no wind was not the miracle I had in mind. Playing Crystal Downs remains on most golfers’ Wish-List before they head toward heavenly courses beyond. My turn originally came despite my status as a ratings panelist for Golf Digest Magazine. Many a golf rater or writer has never set foot on the grounds. If you are either, do not assume announcing it will get you on the course. 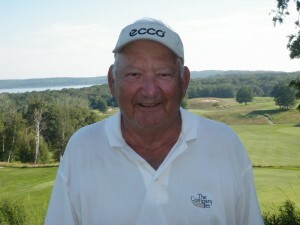 In fact, Golf Digest Editor Jerry Tarde still lists Crystal Downs at the top of his Wish-List of courses never played. There is one hard and fast rule which is never broken: if you are not a member, you must play with a member or someone from the pro shop staff. Now you may think the members are people who are untouchable or arrogant, but you would be dead wrong. They are simply people who cherish their course and know they are favored and blessed to be members at one of the top clubs in the nation. I am fortunate to know Fred, who has introduced me to many wonderful members, one in particular who is the true star of this story. Long-time CDCC Professional Fred Muller, on a rare day with shorts and Polo shirt. With visions of vast PGA souvenir mega-stores present at most Tour events, you’d think Fred’s shop would be huge and stuffed to the rafters with CDCC logo merchandise, given Crystal Downs’ 100 Greatest status. Again, you’d be wrong. It is a humble, warm, and cozy place, complete with a small library and easy chairs posed by large windows overlooking the first tee, which is perched at the top of the property and mere steps from the pro shop door. Read some pages, watch a group tee off, read some more, watch another group. A snack bar is opposite the merchandise shelves, and this time you can grab a homemade cinnamon or lemon roll, sandwich, and a glass of CDCC’s special serve-yourself-on-the-honor-system lemonade or half-tea/half-lemonade (they don’t call them Arnold Palmers here). Find a table by the picture window between the trophy cabinets so you’ll have prime viewing of the devilish 9th, an uphill par 3 with a wicked, sloping, green. Guaranteed, you’ll see some trick shot up-and-downs if you watch for any length of time. Or, you can look east, out of yet another set of picture windows to observe tee-off action on the short par-4 10th, a superb hole with elevated tees to a major drop off of fairway, which then climbs up to a guarded green backed by dense woods. Looking south, you’ll get a beautiful view of Crystal Lake. 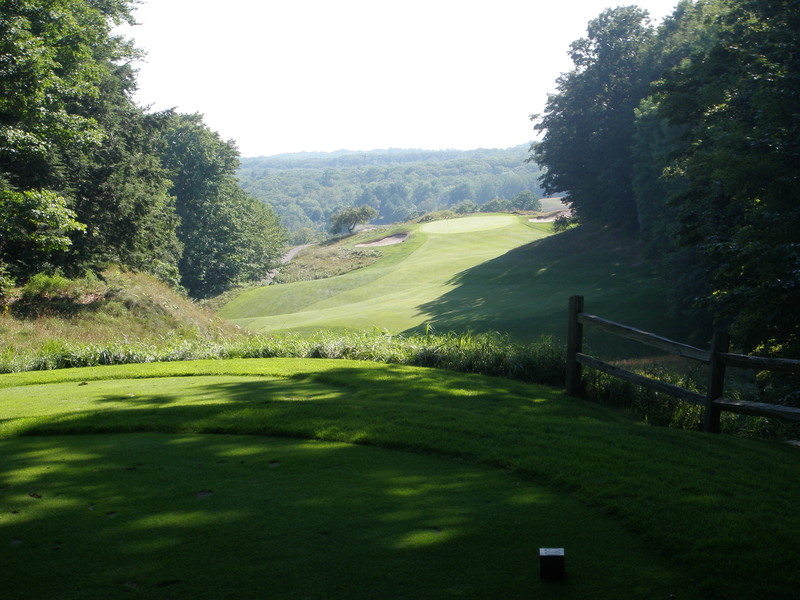 The first time I played Crystal Downs was over 10 years ago, after meeting Fred on the range of northern Michigan’s storied Boyne Mountain’s Alpine and Monument courses. We were both contestants in the Michigan PGA Tournament of Champions, a unique event which pits every category of golfer, amateur or professional, man or woman, senior or junior, against one another, using appropriate tee placements. The only requirement is that you must have won a sanctioned state event. Fred is a former Michigan Open Champion and I won the Golf Association of Michigan’s Tournament of Club Champions. Freddy was a Golf Magazine course rater, and after some good-natured razzing about the practices of competing Golf Digest course ratings panelists – though at the time he didn’t know I was one of those with a later admission I was – he still extended an invitation to play his course. Later that summer, up the fabled serpentine driveway I drove, and at the pinnacle of Crystal Downs, I met a man who indeed is the true miracle there and as much a part of the mystique of Crystal Downs as the course itself. Dr. Roy Vomastek, champion in life.....and golf. later to achieve some amazing golfing feats. My best memory of that day was an all-out duel between Dr. Roy and Fred, who were even coming to the short and sweet par-4 17th hole. With an elevated tee looking down a wide-enough descending fairway framed by thick trees, the hole then heads back uphill to seemingly major elevation, which in reality, is only slightly higher than the teeing ground, and a green with enough bunkers and trouble beyond. Both were ardently explaining how hard this hole was, debating which iron should be hit to keep it in play. Finally, one decided on a 4-iron, the other a 3, and both promptly found the woods on opposite sides of the fairway. I simply chose driver because that club is as straight as anything else. I made birdie, and they made 6 and 7. So much for local knowledge versus beginner’s luck. The pesky, though brilliant, 17th hole decides many matches. At the 2010 Crystal Downs Club Championship, there was drama unlike anything anywhere. Eleven years after Dr. Roy won his first CDCC club championship at age 67, he was playing in the finals against his son, of all people. When the 78-year-old general practitioner sank a clutch 10-foot putt on the par-4 dogleg right 18th hole to edge out his cherished ‘opponent’, the gallery, which included his grandchildren, erupted in stunned cheers. Playing with Doc shortly after this feat, he consistently drove the ball 280 yards with some blasts of over 300 yards. He said I inspired him, but perhaps inspiration had little to do with a flawless body rotation and metronome-like tempo. A great disposition helps, as did a bit of harmless flirtation. Doc takes a kind of joy in the game that is rarely seen these days. Who else would play 18, 36, or 45 holes every day for sheer pleasure? Or could……..at his age? And now, he is still going strong. Rumor has it a Hollywood screen play is being written about his life, which indicates that hopefully the entertainment industry isn’t so far gone with inane reality show concepts to allow an incredibly good and inspiring story to escape, untold. And the 2011 Club Championship? Did he defend? No. Instead he decided to retire from the event, at the top, and opening the door to allow the best player who should have won the club championship many times but never did – the joy of victory. Like an unplayed 12-foot concert Bosendorfer adorning empty space, a golf course with no magicians or artists playing it is simply a tract of land, pretty land certainly, but with no life. Dr. MacKenzie likely had visions of the great golfers who would follow his brilliant layout but is it possible he could have imagined a gentleman – a gentle man – approaching his ninth decade of life, paying homage to family and friends through golf, like Dr. Roy?